Pots and pans hold food, generally for cooking on a range. Sometimes pots and pans are used in an oven or microwave. Dark gummy burned-on oil can be removed with acetone, widely available from hardware stores and in diluted form as nail polish remover. Stainless steel is good enough for most uses, although it is not as conductive as aluminium or copper. Stainless steel tends to be inexpensive and lightweight. Stainless steel has the advantage of being non reactive with most household acids. 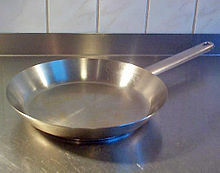 Thin-bottomed pans, often with an insignificant layer of copper, can cause uneven heating, so a layer of aluminium is often "sandwiched" in the base of the pan. Even though stainless steel is not considered non-stick, food does not stick very strongly unless the surfaces are rough. Stainless steel is popular for saucepans and stock pots. Anodizing is an electro-chemical process that molecularly alters the surface of aluminium cookware making it stick and scratch-resistant and easy to clean. A final stage in the anodizing process seals the aluminium, preventing any leaching into food. Unlike uncoated aluminium, this cookware does not react to acidic foods, and is much more durable. Unlike stainless steel, no "sandwiching" or "cladding" is needed for even heating. Anodized aluminium cookware is generally not dishwasher safe. Cast iron is denser than other pan materials, making the pans unparalleled at retaining and evenly distributing heat, but also somewhat heavy. Therefore these pans are excellent for applications such as searing, or any time when a pan must stay hot even as ingredients are added. The pan retains its heat better than most other materials. They can also be put under a very hot grill or into a barbecue or campfire — something that would completely destroy a non-stick pan — as they are all-metal and would have to be melted to suffer damage. Contrary to popular belief, acidic foods can be cooked in cast iron, provided they are removed from the pan as soon as cooking is complete. Cast iron pans can be used for other kinds of cooking as well, although their heaviness makes them somewhat awkward for making, say, crepes, or any other kind of cooking where the pan needs to be moved around a lot during cooking. Cast iron is also less conductive than other materials such as aluminium and copper. This results in the aforementioned excellent heat retention, but also means that cast iron cookware takes longer to heat up and cool down. Cast iron needs to be seasoned to provide a more-or-less non-stick surface. This process involves heating oil so that it polymerizes and binds to the pan. This creates a non-stick surface chemically similar to a plastic coating. Some people see this need for seasoning as a drawback; however, because the seasoning can be removed (with steel wool, even!) and reapplied as needed, cast iron pans can be maintained in excellent condition far beyond the life of a typical non-stick pan. Properly cared for, a cast iron pan can last for generations. Thus they are an excellent value: extremely durable, costing less than all but the cheapest non-stick pans, while outperforming all but the most expensive cookware. The main drawback is that they will rust if washed in a dishwasher or left soaking in water. Also, they should not be washed with harsh, lye-based soap, as this will remove the seasoning. They can be effectively cleaned with a stiff brush, plastic wool, or by rubbing with a paper towel, vegetable oil, and any salt, used as a mild abrasive. Prior to putting them back in storage, if you heat them up, empty, for few minutes, any remaining dampness will evaporate. Generally these retail for no more than US $20. Enamelled cast iron cookware — typically, casseroles or Dutch ovens — enables cooks to take advantage of the heat retention of cast iron while also providing a non-stick, non-rusting, non-reactive, light-coloured surface (the light-coloured surface makes it easier to monitor how foods are browning). The thickness of the cast-iron core helps guarantee even heating and prevents "hot-spots" and warping from occurring, even on electric stoves. Some care must be taken in use and storage, as the enamel surface is vulnerable to chipping. The main drawback of enameled cast iron is expense, with pieces typically being 3-5 times more expensive than their cast-iron counterparts. The enamel is naturally non-stick and cleans easily, but may crack, chip, or discolour over time, particularly if improperly cleaned. Exteriors are generally available in a rainbow of colours. Like cast iron, carbon steel needs to be seasoned and is vulnerable to acid foods. Like stainless steel, carbon steel is lightweight and inexpensive. Carbon steel can be slightly better than stainless steel on an induction-based cooktop. Carbon steel is very popular for woks, particularly the large round-bottomed ones. Aluminium is lightweight and inexpensive. It conducts heat well, especially if it is thick. This allows for even heating and fast response to desired temperature changes. Aluminium usually has a non-stick surface inside it. With or without a non-stick surface, aluminium is vulnerable to scratches. A connection between aluminium and Alzheimer's disease is a concern for many, although a scientific link between the two is inconclusive at best. Uncoated aluminium is vulnerable to damage from acid foods like tomatoes. Low-grade aluminium is easy to dent. Aluminium is popular for frying pans. In Western cooking, the best pots were made out of a thick layer of copper for good thermal conductivity and a thin layer of tin to prevent the copper from reacting with acidic foods. Copper pans provide the best conductivity, and therefore the most even heating. They tend, however, to be heavy, expensive, and to require occasional retinning. Modern copper cookware is now made with stainless steel lining rather than tin. Glass allows food to be observed while the lid is on. Glass is heavy, because it must be thick enough to prevent shattering. To avoid cracks, avoid sudden large temperature changes (do not drop a very hot glass pot into cold water). While not considered non-stick, food does not stick strongly to glass unless baked-on. Glass can be used in a microwave oven. Glass is generally clear or white, the latter known as Corning Ware, a product designed for missile nose cones. Multi-ply pans are made from two or more the above materials. Often times, oxidation-prone copper or delicate aluminium are "clad" in stainless steel or some other sturdier material, combining the best features of the many materials and blunting the disadvantages. Also, many pans come with glass lids to allow the user to see inside the pot or pan as the food cooks. This page was last edited on 24 January 2014, at 06:09.